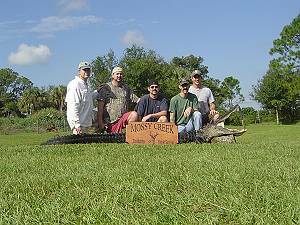 Welcome to Mossy Creek Taxidermy and Alligator Hunting Guide Service in Fort Pierce, Florida. Want an incredible, insane, off the wall bow hunt like you have never experienced before? Gator hunting will take you on a thrill ride that you never knew existed. You know when you are deer hunting and you see that buck come into view, your heart starts pounding, there is a lump in your throat, and your adrenaline rushes through your body? That feeling will begin when you see that first set of red gator eyes glowing in the marshy water, not knowing if he's the trophy you came for. If this is a feeling you enjoy as much as I do, then give gator hunting a try because you will experience this sensation time after time on your two night hunt. 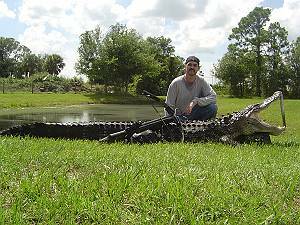 Growing up in South Florida, I have been around alligators all my life and guiding hunts for the past six years. I became a guide because of my love for the outdoors, the ability to share with other hunters an incredible experience, and to create memorable hunting stories. Each year, I travel to different outfitters hoping to experience a quality hunt. To me, a quality hunt is the opportunity to tag a trophy, to have a guide work as hard as he can to provide me with opportunities, and leaving wanting to return the next year all at an affordable price. Although this is a two night hunt, it will seem like a four days. We will begin at sunset and hunt till sunrise usually over 10 hours of continuous hunting only taking small meal breaks. We will be hunting out of a 21 foot custom Go-Devil designed to take us through shallow backwater marshes. Most other guides hunt from noisy airboats, and in my opinion, not able to give you a true alligator hunting experience. 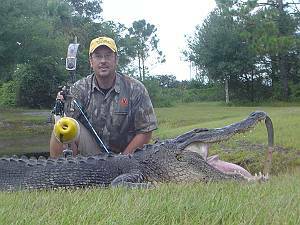 We will be stalking these gators quietly with a trolling motor, like a game of cat of mouse, waiting for the gator to give us an opportunity to get close enough to land an arrow from a bow or crossbow.